New year comes upon the passing of the last moment of the thirtieth day of the twelfth lunar month (the twenty-ninth day in case of a 29-day month of the lunar calendar). The moment is named the “start of a year, a month and an hour.” Every household opens its door and sets off firecrackers. At this moment, people staying up for the New Year’s arrival on ships along the shore will also start anchor windlasses. Withdrawing one-ren (an ancient measure of length equal to seven or eight chi) of anchor line is called “becoming one year older”. Meanwhile, firecrackers will be set off to celebrate as well. 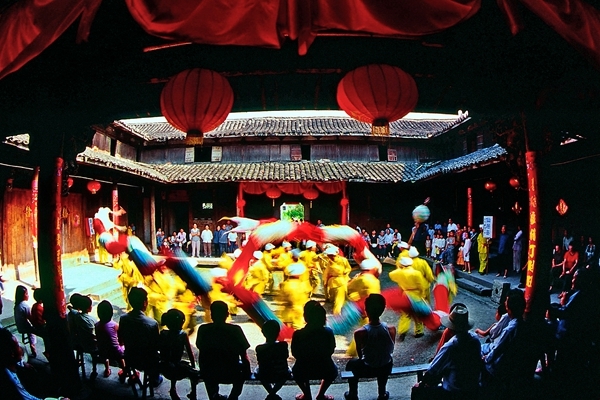 This welcome ceremony was recorded in Jingchu’s Festivals, as “get up at dawn and set off firecrackers in front of houses to exorcise evil spirits on the first day of the lunar New Year”. Nowadays, people follow the custom not for superstitious beliefs, but for welcoming the New Year and praying for good luck. It is called “a start of spring”. According to the old custom, after the start of spring, every household lights candles, incense and spiritual money, offering tea and fruit as a sacrifice to heaven, gods, ancestors and their portraits. Yuhuan natives originating from the south of Fujian province offer sweet tea made of brown sugar and red jujube, together with longans, sweets, cakes, citrus and other food as a sacrifice. According to the traditional practice, people rarely travel on the first day of the first lunar month. They only visit friends and neighbors nearby and send their best wishes to each other. Residents in Yuhuan, Wenling and Linhai often offer red jujube tea, seasonal fruit and sweets to their guests, as the saying goes "red jujubes ensure a good year." However, people do not eat red jujubes, but only take a sip of tea before they leave, as the saying goes “only the people lacking in family education may drink up the tea.” Therefore, there is also a saying that “visiting many homes is better than staying at one.” Each of the children of relatives and friends will get a string of copper cash, called “a gift for the old year’s passing” or “New Year’s gift.” Nowadays, people use red paper to wrap money as a gift, together with biscuits, cakes and seasonal fruit. According to Folk Customs of Linhai County Annals, a record of the area from the Qing Dynasty under Emperor Kangxi’s Reign (1662-1722), Linhai also had the custom of worshipping ancestors’ graves at the start of a new year. Climbing mountains and city tours have become very popular during the festival in the contemporary era. According to Tiantai’s Festivals of Chinese Customs Annals by Hu Pu’an, before the Liberation, women living in Tiantai county’s Chengguan town went up onto the city wall and then went around the city as a “city tour”. Linhai residents once followed this old custom as well.